Through the years, Peru has been a country that has been known worldwide for its rich archaeology, mining and biology. In this last decade, Peru has had a gastronomic boom, a result of its cultural diversity and the miscegenation of different flavors and techniques from its cuisine. Such miscegenation of the cuisine is now happening with the music, where Peruvian rhythms are being infused with other rhythms and concepts such as the ones in jazz. Waijazz represents the meeting point of the two cultures where its creator has lived. Its Andean origins and its passion for jazz have taken him to create this music, whose main goal is to express the love for the two countries that have seen him grow up: Peru and the United States. Waijazz seamlessly fuses a respect for Andean music with the rich texture of jazz in a way that is equally enjoyable by jazz aficionados and casual listeners. The convergence of musicians from U.S and Peru has given birth to a new genre. This genre blends traditional Andean melodies and rhythms with lush harmony, soulful lyrics, and groundbreaking composition and improvisation. 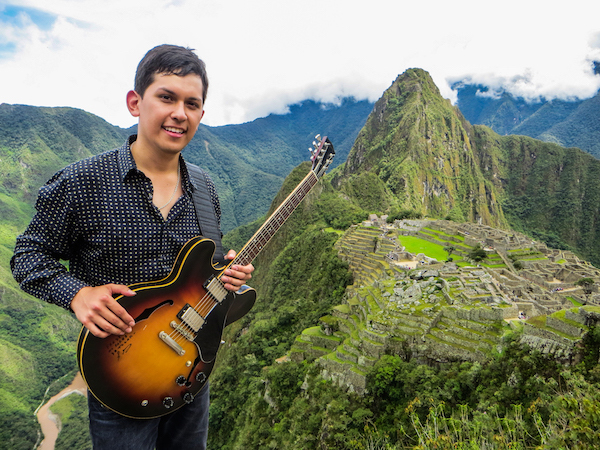 Waijazz is led by Peruvian guitarist/composer/arranger Fredy Guzman. Fredy moved to the States when he was twelve years old and graduated from Berklee College of Music at age twenty-one. His love for Andean music took him back to Peru at age twenty-four, where he is strengthening his identity through traveling in the Andes and immersing himself in the region’s traditional customs. FREDY GUZMAN & WAIJAZZ at Terraza 7 on Saturday January 9th, 2016 at 9:00 pm. No Replies to "FREDY GUZMAN & WAIJAZZ"